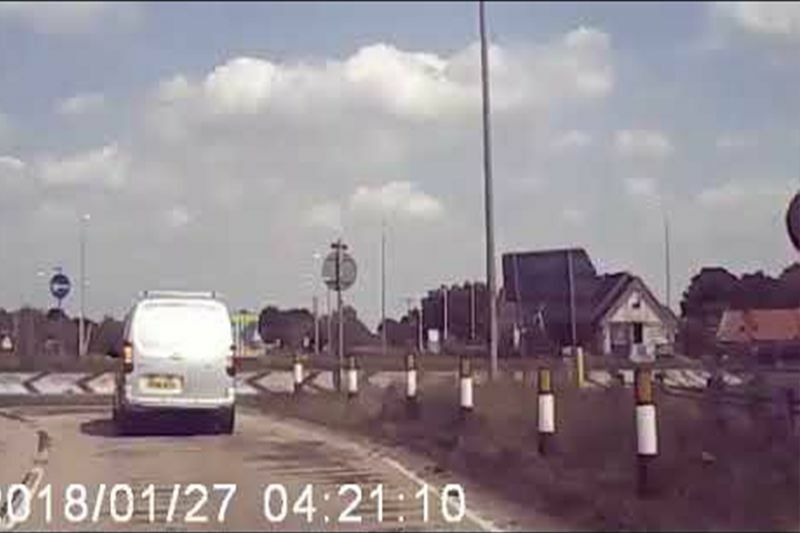 Bizarre dashcam footage captured the moment a van driver apparently failed to see a roundabout and hit it at high speed, launching the vehicle high into the air before crashing. Of all the sights you might expect to clock on your commute, a flying van wouldn’t be among them. Still, that’s exactly what this dashcam footage has captured at a roundabout in Norfolk. As other traffic slows for the Stag roundabout on the A11, the silver van driver is totally unaware of his impending doom as he undertakes the camera car at speed and launches nose-first into the sloped edge of the roundabout. At that point the van launches, and I mean really launches, into the air, reaching at least 10 feet off the ground; possibly higher. Judging by the seconds counting at the bottom of the screen the footage is sped up, but even so, the height the van achieves is crazy. Fortunately, and astonishingly, no one seems to have been badly hurt in a crash that could so easily have killed people. A similar incident was recorded last year when a drunk 32-year-old mother did much the same thing on a roundabout in Peterborough, with her own child on board at the time. Although the launch was similarly dramatic, both occupants escaped major harm. Video: Top 7 High Revving Engine Cars! Video: Bus Driver In Korea Falls Asleep Ploughs And Causes A Huge 6 Vehicle Accident, With Reverse Camera Catching It All! Video: Evo Tests Out The Porsche 911rs Top Speed Of 323km/h On The Autobahn! Video: Watch This Brand New Nissan Gt-r Crash And Cry! Video: We Have Lift Off! ' Stevie Jackson Just Had A Terrifying Crash At 'no Mercy 7', The Biggest And Baddest Drag Radial Race In The World, And It Was All Caught On Drone Camera!